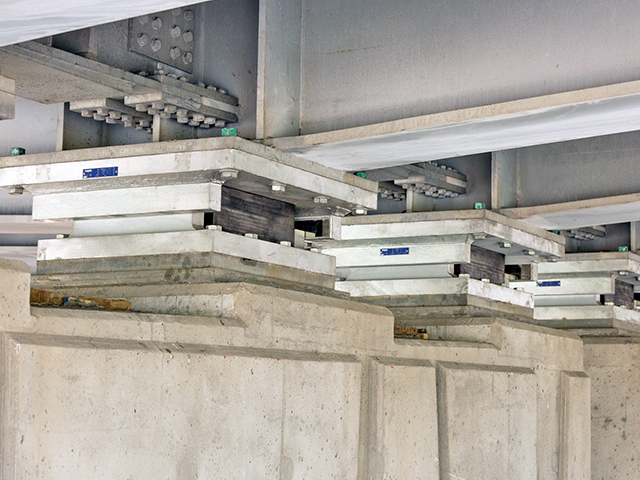 Canam-Bridges just supplied seismic isolators for two overpasses located at the Félix Leclerc (Highway 40) and Laurentian (Highway 73) interchange in Quebec City, Quebec. As part of this project, two overpass ramps underwent repairs while two bridges were demolished and rebuilt. The structures were designed by a consortium composed of BPR and EXP, and the project was carried out by EBC Construction on behalf of the Quebec Ministry of Transportation. Canam-Bridges provided various Goodco Z-Tech products for this project, including new expansion joints for all structures, 36 sliding laminated bearings for the abutments of the two rebuilt structures, and 18 seismic isolators for the bridge piers. Lead-rubber bearings were installed under the girders of the isolated bridges. The bearings are supplied with guide bars that impede transverse movement. 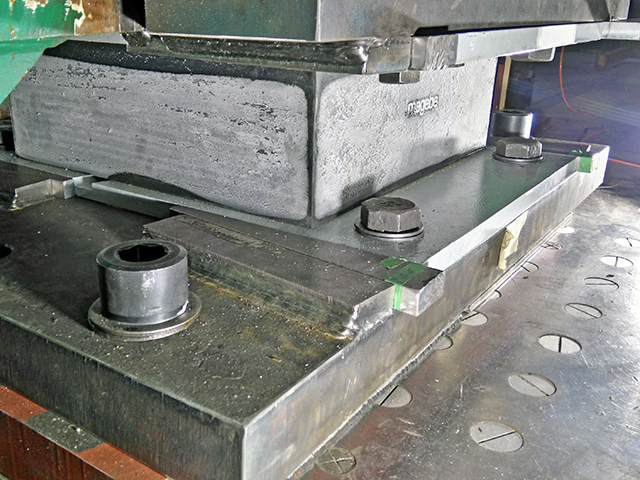 Lead-rubber bearings were chosen for the seismic isolation of these bridges. This type of isolator provides a good balance between damping and cost. Since all components are vulcanized inside the rubber, no special maintenance is required beyond that of laminated bearings. 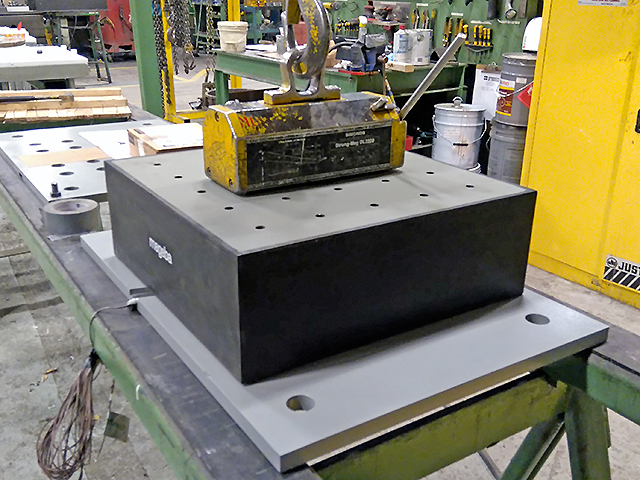 Unlike typical bearings, all isolators used in a structure must be tested. These tests are divided into two categories: prototype testing and quality testing. Prototype testing ensures that design characteristics are met at different operating temperatures. Quality testing, in turn, ensures that all isolators exhibit similar behaviour and that they don’t have any manufacturing defects. Prototype testing is performed on two full-size prototypes for each isolator model. Therefore, using only one type of isolator per structure can reduce the cost and time for this testing. Since lead-rubber bearings can be combined with traditional laminated bearings under the same bridge, the costs and delays associated with testing are also reduced by minimizing the number of isolators used. 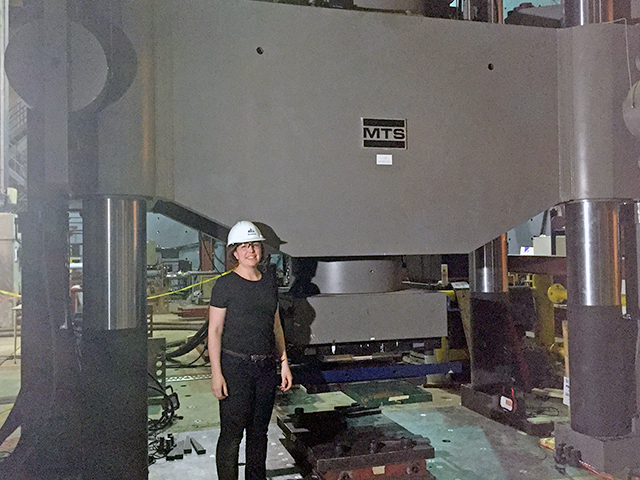 The vertical press that was used to complete the prototype and quality testing has a maximum compression capacity of 12 MN. Tests were performed by an independent laboratory. The designer created the prototype testing protocol for this project. The extremely rigorous protocol was a hybrid between the tests required by the Canadian Highway Bridge Design Code CAN/CSA S6-06 and its latest version S6-14. As required by the new code, testing was completed for three temperatures, 20°C, -30°C (minimum service temperature) and -8°C (concomitant minimum service temperature). Testing at the two highest temperatures (20°C and -8°C) had to reach 125% of the expected seismic movement. In addition, seismic verification tests were performed on the two prototypes as called for in the protocol, a requirement which was in the S6-06 code, but which is not in the new S6-14 code. Low temperature tests for each project are a specific requirement under the Canadian Highway Bridge Design Code. As US and European design codes require no such tests on full-size prototypes, the knowledge of a local manufacturer such as Goodco Z-Tech becomes all the more important for respecting the prescribed limits. A prototype being installed in the testing machine after being conditioned at -30°C. Frost starts to form on the rubber surface due to the temperature differential. For low temperature testing, prototypes are conditioned for the period indicated in the test protocol (72 hours in this case). Then, the isolators are taken out of the freezer, installed under the press and tested, all in less than 30 minutes to avoid warming up the isolators and skewing the results. Frost forms on the isolators during the time between when they are removed from the freezer and the start of testing. One of the prototypes in the Canam Group plant in Laval. The isolator must be correctly positioned on the transfer plate to fasten the 22 connecting bolts. For testing at 20°C, the test protocol also required waiting periods to ensure the lead core temperature does not exceed 25°C at the start of certain test cycles. As it yields, the lead core dissipates a lot of energy, thereby increasing its temperature. Since temperature affects the lead’s yield strength, performing all the 20°C test cycles without pause would skew the results. To fulfill this requirement, the lead core temperature was monitored in real time by a thermocouple placed on the lead core. The same thermocouple was used to determine the time required to cool the bearing during its low-temperature conditioning. Once the designer and site supervisor had approved the prototype testing results, production bearings underwent quality testing. Finally, the bearings were installed under the bridge girders. For questions about this article, contact us.